Went with a few coworkers to get bibimbap for lunch! 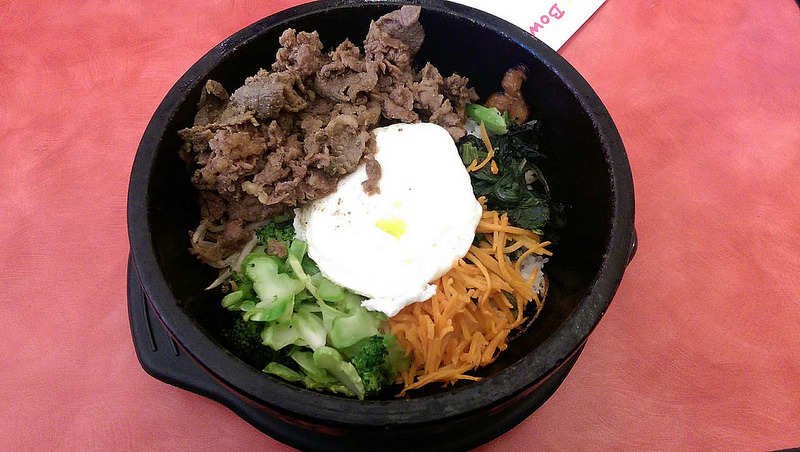 At Sunny Bowl, you can get bibimbap in a regular bowl (cold) or in a stone pot (hot). You can also choose what type of topping you want; beef (beef rib eye), kalbi (beef short ribs), chicken, shrimp & broccoli, tofu & asparagus, egg batter fish, tuna sashimi, or seeweed salad. You can also choose two toppings for an additional cost. All bibimbap contains jasmine rice, bean sprout, spinach, squash, carrot, mushroom, broccoli, and egg. I got the dolsot bibimbap, with beef. I added kimchi, gochujang (hot pepper paste), and sesame oil to my bowl, then pressed it against the stone pot to get the rice crispy. The stone pot is really hot, and keeps the food hot till you’re done eating. Bibimbap (비빔밥, sometimes anglicized bi bim bap or bi bim bop) is a signature Korean dish. The word literally means “mixed rice”. Bibimbap is served as a bowl of warm white rice topped with namul (sautéed and seasoned vegetables) and gochujang (chili pepper paste). A raw or fried egg and sliced meat (usually beef) are common additions. The ingredients are stirred together thoroughly just before eating. A variation of this dish, dolsot bibimbap (돌솥 비빔밥, dolsot meaning “stone pot”), is served in a very hot stone bowl in which a raw egg is cooked against the sides of the bowl. The bowl is so hot that anything that touches it sizzles for minutes. Before the rice is placed in the bowl, the bottom of the bowl is coated with sesame oil, making the layer of the rice touching the bowl golden brown and crisp.